Toilet Plumbing Service in San Antonio. Same day service open 24 hours 7 days a week. 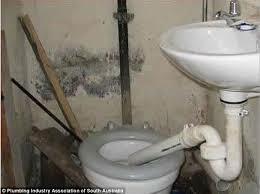 Check out our easy to repair Toilet Plumbing tips or let us take care of your Toilet Plumbing needs. Toilets that fill slowly are usually in need of a new ballcock. It is sometimes possible to adjust an existing ballcock to increase its flow rate, but replacement is usually the most logical course of action. A crimped supply tube can cause a toilet to fill slowly. Every now and then a supply tube is hit with a mop or kicked to a point that it crimps. These occasions are rare, but they do happen. Don’t neglect to inspect the closet supply when troubleshooting for the reason a toilet is filling slowly. The cutoff valve under a toilet should always be checked to prove that it is in a full-open position. It is possible that debris has gotten into the stop valve or the supply tube. To check for this, disconnect the ballcock nut and check the water pressure at the top of the closet supply tube. If it is inadequate, remove the supply tube and see what the pressure is like at the valve. If you are still experiencing low pressure, look to the water distribution piping. If a toilet is supplied with water from a galvanized steel water pipe, there is a good chance the water distribution pipe will need to be replaced. Galvanized pipe tends to rust and clog up with age. To determine if the problem is in the distribution pipe, all you have to do is remove the stop valve and check the pressure at the end of the water pipe. Be careful not to flood the bathroom when conducting this test. To avoid flooding, have an assistant standing by the main water cutoff to quickly turn the water on and off’. You won’t need much time to see how much water shoots out of the pipe. 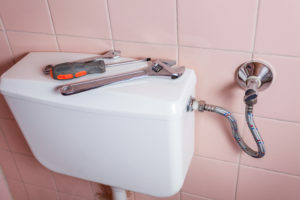 If you have to work alone, you can loosen the stop valve until water sprays out around the connection between the valve and pipe. By doing this you can tighten the connection quickly and keep the water spillage to a minimum. At Chambliss Plumbing®, we never charge extra for plumbing services performed on nights or weekends and we always provide a written estimate before any services are performed. Our San Antonio Plumbing Services are provided 24 hours a day, 7 days a week. At Chambliss Plumbing® our San Antonio plumbers are well-trained and professionals who are dedicated to your complete satisfaction. We provide free estimates, no trip charges and all of our plumbers are back-ground checked and drug tested.